Forum. International seminar with participation of: Simon Sheikh, Fulya Erdemci, Rachel Anderson, Josep-Maria Martín, Laia Solé, Nicolás Dumit Estévez, Fadhila Mammar, Virginia Villaplana, Pilar Bonet, Torolab-Raúl Cárdenas, Democracia, Straddle3-David Juàrez. Project workshop. Directed by Torolab-Raúl Cárdenas. The artistic practices that affect social space are intimately linked to the city and to social and cultural policies. All these elements sustain a relationship of mutual interaction and dependence. Under this postulate the concept of citizenship would be treated from the viewpoint of the artistic practices that work on this line from areas such as representation, participation or direct action; and in relation to other agents who consider citizenship a subject of analysis in the social and political context. The condition of citizenship lies under the conflict. Conflict does not exist without a consciousness of one’s identity, and a sense of belonging to a concrete group with some common social, cultural and political goals. The changing scenario of our cities with the visible presence in public space of cultural and ethnic multiplicity causes social mobilization in order to redefine the concept of citizenship and to reach new spaces for representation. The relationship local-global, national-universal affects the logic of the expanded citizenship and affects, also, the artistic practices that try to find in the city a means of action. Artistic and creative practices are often little involved with the social context and their presence in the educational field is limited, which does not help to solve certain antagonistic problems of communication of these types of practices with the citizenship. 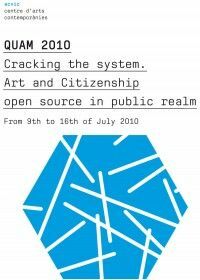 Open source in this context refers to the possibility of modifying collectively, of constructing together meanings and representations in the mutable complexity of the social context of the city. This seminar is conceived from two perspectives, that of artistic practices and that of sociocultural practices, very often little connected. Artistic practices point out possible proposals, from unvealing latent situations, to bringing solutions, to promoting strategies and applicable guidelines which can take shape in cultural or social policies. Social and cultural practices are aimed at promoting imaginative situations in order to increase the intercultural |relationships or communication among the different forms of citizenship currently existing in public spaces. - Experiences that bring up alternatives to the conflict between citizenship and artistic practices. - Artistic practices in the social space, among interaction, participation and mediation. - The conflicts of citizenship in the social, cultural and political context. The seminar and workshop are aimed at artists, social researchers, educational workers, cultural managers and different creative workers interested in promoting actions affecting social, cultural or spatial policies. Also to media, politics, anthropology, pedagogy, sociology, design, architecture, art students and students from other disciplines who may find these subject of common interest. Seminar. Friday 9th of July. Artistic practices in social space, among interaction, participation and mediation. Alternative proposals for working on the relationship between citizenship and artistic practices. Torolab was founded in 1995 by Raúl Cárdenas Osuna in Tijuana BC, Mexico. Torolab, is a collective workshop/laboratory of contextual studies that identifies situations or phenomena of interest for research. The results of which should, in some way, enhance people's "quality of life". Their projects develop according to their competence and in collaboration with artists and experts sharing their fields of study and investigation. Torolab areas of concern are as broad and varied as the lifestyles and environs studied treating subjects such as identity of the border region, housing, safety into community building and urban survival. Visual artist. Art Teacher at the UVIC. Laia Solé develops projects in specific settings with the collaboration of their residents and users, as well as artists, architects and anthropologists. She is interested in the mechanisms connecting individuals with places and communities; investigating the expressions and negotiations that take place in those spaces and intervening through actions that expose and alter existing dynamics. She mainly works in public spaces - neighbourhood communities, sports clubs and hospitals - creating publications, video and installations, and organising events in Barcelona, Madrid, Rome, Jerusalem, Belgrade, Prishtina, among other cities. With the project Balkan Suite,she has received a grant from Olot's City Visual Arts, and with Homelessing in Europe, the Generations (Generaciones) grant from Caja Madrid. Historian and art critic. Art and contemporary design teacher at the Universitat of Barcelona and the Universitat Ramon Llull. She has curated several exhibitions of historical research, and many more dedicated to contemporary artists (Carlos Pazos, Eugènia Balcells, Perejaume, Concha Jerez, Francesc Abad, Rogelio Lopez Cuenca). She has produced exhibition projects from the collections of the IVAM, MACBA and diverse collaborations with Catalan museums. She contributes to several magazines and teaches seminars on art criticism and contemporary production, always with special attention to social and political questions of art. She is a member of the board of directors of the Centre de Producció Can Xalant of Mataró and of the ACM, a contemporary cultural organisation. Director of ACVic Centre D'Arts Contemporànies. From 1999 he managed the art project IDENSITAT. Joint manager of the Master's Degree in Design and Public Space in Elisava/Universitat Pompeu Fabra. In 2005 curated Madrid Abierto and acted as advisor in later editions (2007-2009). He has organised several seminars, workshops and debates on art and social space. He has edited books such as Acciones Reversibles. Arte, Educación y Territorio. (EUMO Editorial / ACVIC, 2010); Local / Visitante. Arte y creación contemporánea en el espacio social (Idensitat, 2010); Arte, experiencias y territorios en proceso (Idensitat, 2008). His work has developed through an interest in interdisciplinary projects, and in the functions art can exert in a specific social and political context. Forum. Friday 9th and Saturday 10th of July. Project workshop. Monday 12th to Friday 16th of July. Fee to attend the Forum is 30€. Members of H.AAC (H. Associació per a les Arts Contemporànies), of UAAV (Unión de Asociaciones de Artistas Visuales), of APGCC (Associació de Professionals de la Gestió Cultural de Catalunya) and students 20€. Fee to attend the Forum + Workshop is 120 euros. Members of H.AAC (H. Associació per a les Arts Contemporànies), of UAAV (Unión de Asociaciones de Artistas Visuales), del APGCC (Associació de Professionals de la Gestió Cultural de Catalunya) and students 100€. Fee covers accommodation and half-board during the workshop (breakfast and lunch). Forum + Workshop: Completion certificate. Recognised by Universitat de Vic as equivalent to 3 course credits. Saturday from 11h to 14 h. and 17h to 20 h.
Sunday and festives from 11h to 14 h.
Currently QUAM will be part of the Centre d'Arts ACVic, managed by H. Associació per les Arts Contemporànies and directed by Ramon Parramon. ACVic defines itself as a centre focusing on the relationship among educational actions, territory issues and social interaction. Artistic practice is understood as a practice that affects, interacts with and transforms social space. Art combined with education can generate production spaces, open to experimentation. ACVic´s work is made possible thanks to the support of the Generalitat de Catalunya, Diputació de Barcelona, Ajuntament de Vic, Universitat de Vic and Escola d'Art i Superior de Disseny de Vic in whose premises the worksops will be carried out .